In a Republican county in a Republican state, Coral Stavros, is waiting for Stacey Abrams. "Stacey Abrams represents the future of Georgia as I want to see it," the 55-year-old said with a glint in her eye. 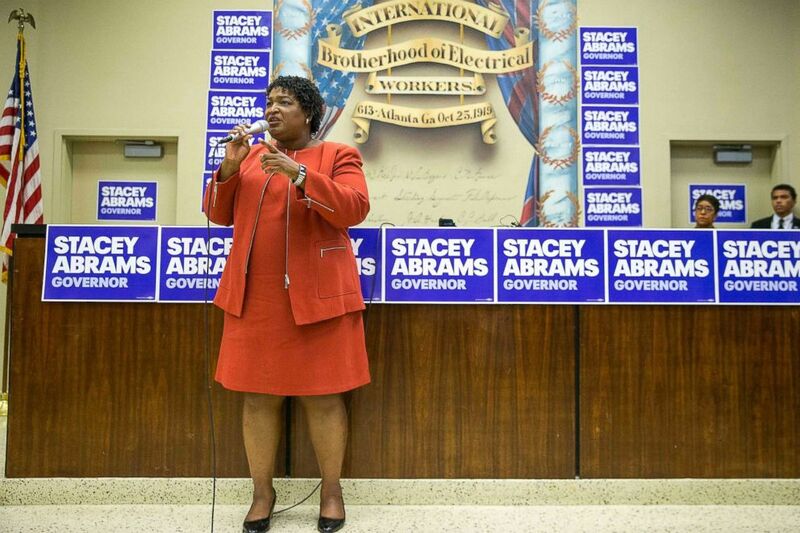 Gubernatorial candidate Stacey Abrams speaks during a campaign stop in Atlanta, Oct. 21, 2018. Donning a "Make Racism Wrong Again" hat, the regional manager "for a food brand you've probably never heard of", said that Georgia -- despite its conservative leanings -- is ready for a Democrat like Abrams, who's running for governor. "I absolutely think Georgia is ready for a progressive Democrat. I mean this is the birthplace of civil rights...We're the capital of the south and we are the leaders of new thought in the south," Stavros said. "And it's time." Georgia's gubernatorial race is one of the most closely-watched races in the nation. On one side there is Abrams, the Democratic leader in the Georgia House Representatives. Her candidacy is, in large part, the reason why this race has attracted so much national attention. Were she to win, she would be the first African-American female governor in U.S. history. There is also the Trump-backed Brian Kemp. He currently serves as the Secretary of State for Georgia, the office responsible for running the state’s elections. Secretary of State Brian Kemp, with his wife Marty and daughter Lucy, gives the double thumbs up making his first campaign stop during his Putting Georgians First Fly Around at Peachtree DeKalb Airport, July 23, 2018, in Atlanta. And therein lies the other reason for all the publicity; in recent weeks, his office has been swamped with allegations of rampant voter suppression. Multiple organizations including the ACLU and the NAACP have accused Kemp's office of using tactics that disenfranchise minorities from voting. He has vehemently denied any impropriety, insisting that his office is simply enforcing laws that are on the books in their larger goal to prevent voter fraud. As ABC News traveled around Georgia, we spoke with both candidates about their plans and the controversies surrounding this race. Kemp, 55, has made a name for himself as a down-home conservative who doesn't care about what anyone thinks. One of his controversial campaign ads from the primary depicts Kemp, holding a shotgun, and later a chainsaw, proudly making statements like, " I own guns, and no one’s taking ’em away," and "I got a big truck, just in case I need to round up criminal illegals and take ’em home myself." That message resonates with many in his home state. At a Kemp campaign rally in Jesup, Ted Badami, a retired federal law enforcement agent, was on hand with his daughter Gianna. ABC News' Deborah Roberts asked him what he thought of Kemp's message. "It's right along the lines of conservative values," Badami said. "I'm originally from Michigan I was born in Ohio and raised in Michigan. Conservative communities I think we have a lot in common." he said. "Immigration's important, the values. I like the fact he's talking about paying teachers more and supporting law enforcement." Statistically, the two are in an almost dead heat -- a surprising phenomenon for a reliably conservative state. The last time Georgia elected a Democrat was more than 20 years ago. ABC News requested a formal interview with Kemp but his campaign declined. Still, Roberts was able to ask the Secretary about the race after a campaign stop in Ludowici. "It’s been a lot of momentum on the Democratic side all around the country from their base," Kemp said. "I think the reason it was so tight early on because the Republican base was not real motivated. That’s changed a couple of weeks ago." President Trump endorsed Kemp early in the race and has been, of late, tweeting on his behalf. Trump will also campaign for Kemp on Sunday, two days before the election. Meanwhile, Abrams has garnered the support of big names in Hollywood: John Legend has hosted fundraisers; Will Ferrell knocked on doors in Georgia for her, and musician Common has campaigned for her. Senators Elizabeth Warren and Cory Booker have campaigned for her as well, and former President Barack Obama will join her at a campaign rally on Friday. 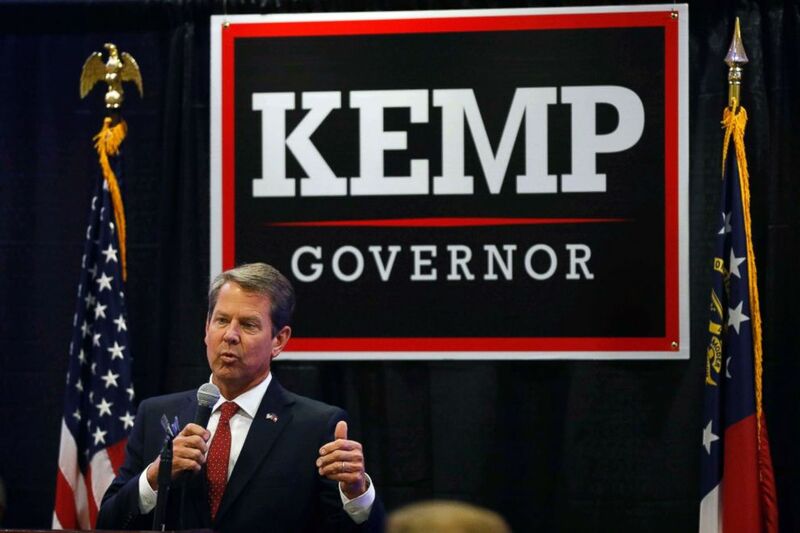 Kemp has used that to his advantage -- attacking Abrams for receiving 65 percent of her donations from out of the state. Kemp calls her views and values out of touch with "real Georgians." Abrams, in an interview with Roberts aboard her campaign bus, said she doesn't mind being characterized as a nationally-known campaign figure. "We have received funding from across the state, but [in terms of] individual donors, we have more than five times the number of individual donors [as Kemp] from the state of Georgia giving to us," she said. "I believe that we have to run a local campaign that is nationally-known because Georgia wants to be a leading state." 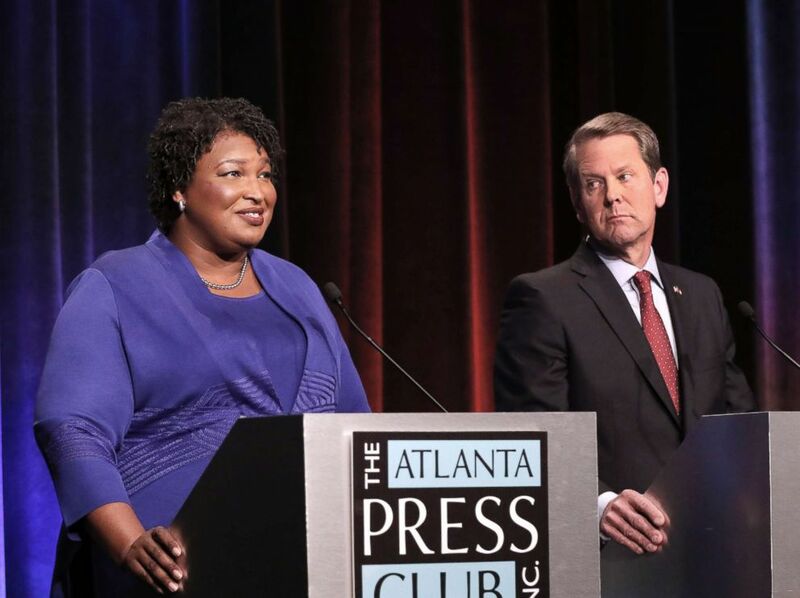 Kemp's has underscored his claims that Abrams is an extremist with a bit of sound caught on tape in which Abrams can be heard saying that the blue wave sweeping the country "is comprised of those who are documented and undocumented." Kemp has said that Abrams wants to see "illegals voting." "Of course not," Abrams told Roberts. "I know that the only people who are allowed to vote are eligible citizens." Abrams, 44, who writes mystery novels in her spare time, is running an unabashedly progressive campaign. She's an ally for LGBTQ equality, a proponent of stricter gun control and believes in expanding Medicaid. Roberts asked Abrams if she thinks that she can break the Republican winning streak in Georgia. "Absolutely. Because Georgia has changed over the last 20 years. Demographically we are a much more diverse state. But also the issues that I'm talking about resonating across ideologies," Abrams responded. But at the heart of this battle for Georgia's future lies bitter talk about Georgia's past. The state -- and particularly Kemp's office -- has come under fire for what critics say is a blatant attempt by Republicans to intimidate voters of color. Atlanta-based attorney Emmet J. Bondurant said he has watched it happen for decades. "Georgia's no different the rest of the nation," Bondurant said. "It has become progressively more polarized, more vitriolic. The electoral process has become much more poisonous than in the past. And we are no exception to that," he said. The examples are plentiful. An Associated Press report found that 53,000 voter registration applications are on hold, thanks to a so-called "Exact Match" law. It requires voter information to exactly match other government records. A misplaced hyphen or a middle initial, instead of the full name, can stall an application. Critics have called the law overly restrictive. While most of these voters should still be able to vote on Election Day if they provide a photo ID, experts said that their “pending” registration status means their votes could be challenged and their registrations might be deleted. Roberts asked Kemp about those allegations. "Well that is a myth Democrats bring out every two years," he said. "We have a record number of people on our voting rolls, we have a record number of people voting in the presidential election. I created, through the legislature, and implemented online voter registration. " But, out of those 53,000 pending voter applications, 80 percent are African-American, Latino or Asian-American -- voting blocs that, while not monolithic, tend to swing Democrat. 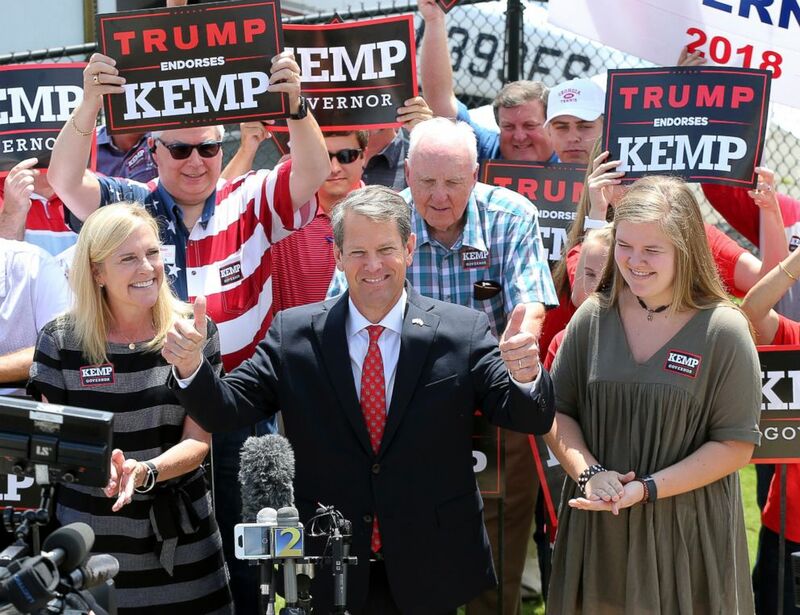 When asked about that, Kemp brought up the voter registration group that Abrams founded, The New Georgia Project. The group's goal was to register minority voters. The State Elections Board last year referred 53 allegedly forged voter applications to the Georgia Attorney General’s Office, out of 87,000 that were submitted in 2014. The Attorney General eventually found no wrongdoing by the group. Yet Kemp said minorities are among those targeted "because that's who her group signed up." "There is no purging," he added. "We are following federal laws to keep our voting rolls clean. That word, purging, is outrageous." Exact match requirements don't just apply to registrations. There's also a signature match requirement in Georgia that prompted local election officials to toss absentee ballots and applications if the officials, who are not trained in handwriting analysis, determine any signature doesn't match others on file. Last week, a federal judge temporarily blocked Georgia election officials’ practice of discarding absentee ballots because of mismatched signatures and ordered officials to provide provisional ballots to these voters. Kemp has appealed that ruling, calling absentee voting a “privilege and a convenience,” and not a Constitutional right. Georgia gubernatorial candidates (L-R) Democrat Stacey Abrams and Republican Brian Kemp debate in an event that also included Libertarian Ted Metz on Oct. 23, 2018, in Atlanta. Lana Goitia, a 21-year-old student at the University of North Georgia, said she applied for an absentee ballot, eager to vote in her first midterm election. "It's pretty exciting to have the opportunity to have a say in some big decisions for a state and for our governorship, so it's very important and exciting for me," she said. Her home polling location is in Loganville, about an hour's drive from her campus. Since she works and takes classes, she knew she wouldn't be able to make it there on election day and filed for an absentee ballot. "I've made sure to fill it out correctly and then sent it in," she recalled. About two weeks later, she said, "I got notice that it had been rejected." She said she was told that her signature looked different than the one on voter registration application from four years ago. "I received notice that it had been rejected, but before the rejection, I received no notice that, 'hey look these aren't matching up,'" she said. "I wasn't given a process to, you know, fix my ballot or have it reinstated prior to the rejection." Goitia said that, as a young Hispanic woman, she feels her ballot was targeted. "I think votes like mine are ones that scare Secretary Kemp," she said. "I think those are votes that stand to be, you know, challenged -- that stand to have barriers placed in front of them because I think the young people, and particularly in minority groups, are groups that he is scared of." Civil rights groups, including the American Civil Liberties Union (ACLU), have filed lawsuits that claim hundreds of absentee ballots and applications were tossed. A judge halted that practice last week and Kemp appealed, calling absentee voting "a privilege and convenience." Kemp's office said that he's trying to protect the integrity of the polls and prevent voter fraud. According to experts, though, voter fraud in Georgia is almost non-existent. The Heritage Foundation, a conservative think tank, found that Georgia officials have pursued 19 election fraud cases in the past two decades. Seven of those cases resulted in a criminal conviction. Brian Kemp, the Republican nominee for Georgia governor, speaks at a rally at the Classic Center in downtown Athens, Ga., Oct. 9, 2018. Bondurant, who's been arguing civil rights cases since the 1960s, sees this as a reason for concern. "I am both surprised and disappointed that 50 years after the Voting Rights Act was enacted that we're going in the opposite direction of making it harder for people to vote," he said. A study conducted by the U.S. Commission on Civil Rights examined five common voter suppression tactics. The study determined that voter identification laws, proof of citizenship requirements, purges, cuts in early voting, and polling place closures. Georgia is the only state once under federal oversight to have adopted all five. Abrams has called for Kemp to step down from his position as Secretary of State, as has former president and Georgia Governor Jimmy Carter. "I will say that as the ACLU of Georgia we would prefer not to be suing one of the candidates for governor when we have to sue the secretary of state over how the election is being administered," said Andrea Young, Executive Director of the ACLU of Georgia. But Kemp has resisted, saying that he's doing just as other elected officials have done, including Democrat Cathy Cox who remained as Georgia's Secretary of State when she was running for governor. But, despite all the allegations, early voting numbers have already been higher in Georgia than this time last cycle, with lines at some polling places lasting up to three hours. In Jesup, Badami said he sees himself in Kemp. "I think we have a lot in common," he said. "We're talking about conservative values. Immigration's important...I like the fact he's talking about paying teachers more and supporting law enforcement." In Dooley County, Michael, who declined to give his last name, said he sees himself in Kemp. In Newnan, Stavros is optimistic. "My hope for Georgia is that we are seen as a progressive state that is promoting equality. I don't see what could possibly be wrong with progress and equality. "Democracy dies in darkness and it requires participation," she said. "And I would never really live with myself if I didn't participate in trying to save it." This report was featured in the Thursday, Nov. 1, 2018, episode of ABC News' Daily news podcast, "Start Here."